Wendy Mandel McDaniel loves St. Augustine. Along with her husband, she raised their four children in this historic city. 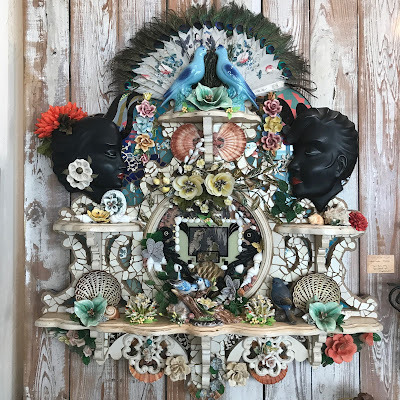 Wendy is a self-taught artist and uses found objects, ceramic, glass, stone, metal and wood to convey a story, create beauty, to engage the viewer and take them to their own personal place. It can be difficult to describe the work of Wendy Mandel McDaniel, the word often heard is a 'shrine'. 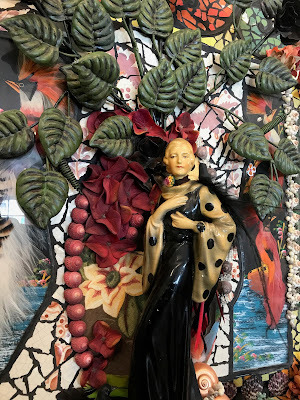 Perhaps her greatest pieces are just that, shrines to art and memory. Combining her talents for mosaic and a keen eye for found objects, each creation becomes a statement of emotion. Colors, sometimes subtle, sometimes bold, play together perfectly. Each glance reveals something unseen, a flower, a shell, a mirror perhaps. 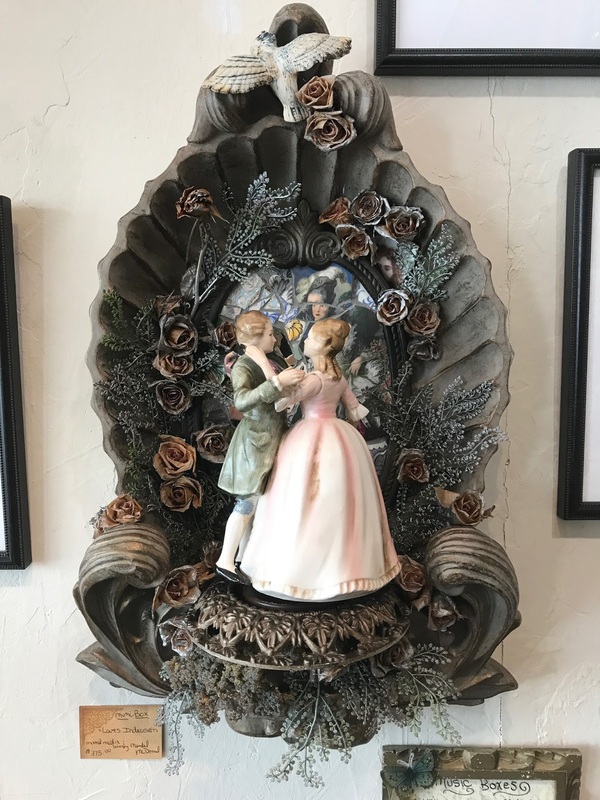 Residents of North East Florida, may be familiar with Wendy's public installations, often created with friend and fellow Amiro Artist Jan Master. Together, the created the map of the city in mosaic at the Visitor Information Center, as well as work at the Police Athletic League's 'Wisdom Walls' in Jacksonville. Wendy also took part in the 450 Compassion Project, as one of the artists selected to create an obelisk for St Augustine's 450th Anniversary, which was housed at the Sisters of St. Joseph Motherhouse. 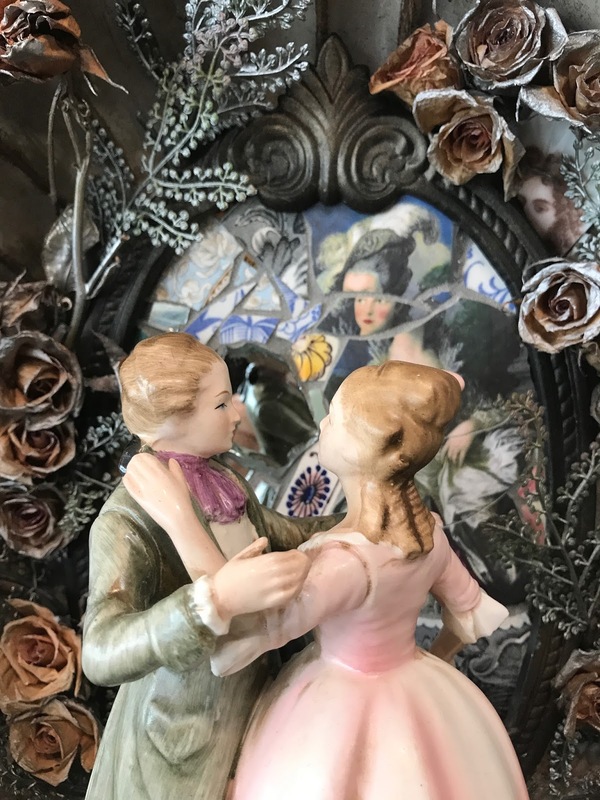 In her own words "As an adult, triggered I suppose by these vivid memories, I scour thrift stores and yard sales, flea markets, and junkyards searching for my lost inner child. I draw inspiration from the natural world as well. Moss, dried flowers, stone, and wood. For me, their essence is vital to counter balance the artificial. In my pieces, it is sometimes difficult to tell one from the other - I find a strange irony in this organic interplay - it adds to the fantasy quality and makes the telling much more interesting." We are delighted to bring this amazing work to you and we hope that through Wendy's sense of wonder, you too can find your inner child in her work. Join us tomorrow for First Friday Artwalk.